(Nanowerk News) This dramatic new image of cosmic clouds in the constellation of Orion reveals what seems to be a fiery ribbon in the sky. This orange glow represents faint light coming from grains of cold interstellar dust, at wavelengths too long for human eyes to see. It was observed by the ESO-operated Atacama Pathfinder Experiment (APEX) in Chile. Clouds of gas and interstellar dust are the raw materials from which stars are made. But these tiny dust grains block our view of what lies within and behind the clouds -- at least at visible wavelengths -- making it difficult to observe the processes of star formation. This is why astronomers need to use instruments that are able to see at other wavelengths of light. At submillimetre wavelengths, rather than blocking light, the dust grains shine due to their temperatures of a few tens of degrees above absolute zero . The APEX telescope with its submillimetre- wavelength camera LABOCA, located at an altitude of 5000 metres above sea level on the Chajnantor Plateau in the Chilean Andes, is the ideal tool for this kind of observation. This spectacular new picture shows just a part of a bigger complex called the Orion Molecular Cloud, in the constellation of Orion (The Hunter). A rich melting pot of bright nebulae, hot young stars and cold dust clouds, this region is hundreds of light-years across and located about 1350 light-years from us. The submillimetre-wavelength glow arising from the cold dust clouds is _place_holder;seen in orange in this image and is overlaid on a view of the region taken in the more familiar visible light. The large bright cloud in the upper right of the image is the well-known Orion Nebula, also called Messier 42. 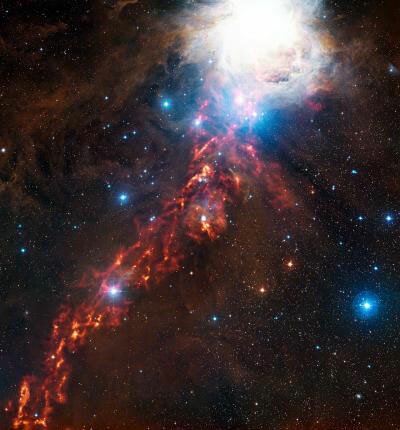 It is readily visible to the naked eye as the slightly fuzzy middle "star" in the sword of Orion. The Orion Nebula is the brightest part of a huge stellar nursery where new stars are being born, and is the closest site of massive star formation to Earth. The dust clouds form beautiful filaments, sheets, and bubbles as a result of processes including gravitational collapse and the effects of stellar winds. These winds are streams of gas ejected from the atmospheres of stars, which are powerful enough to shape the surrounding clouds into the convoluted forms seen here. Astronomers have used these and other data from APEX along with images from ESA's Herschel Space Observatory, to search the region of Orion for protostars -- an early stage of star formation. They have so far been able to identify 15 objects that appeared much brighter at longer wavelengths than at shorter wavelengths. These newly discovered rare objects are probably among the youngest protostars ever found, bringing astronomers closer to witnessing the moment when a star begins to form. Hotter objects give off most of their radiation at shorter wavelengths and cooler ones at longer wavelengths. As an example very hot stars (surface temperatures around 20 000 degrees Kelvin) look blue and cooler ones (surface temperatures of around 3000 degrees Kelvin) look red. And a cloud of dust with a temperature of only ten degrees Kelvin has its peak of emission at a much longer wavelength -- around 0.3 millimetres -- in the part of the spectrum where APEX is very sensitive. The research on protostars in this region is described in the paper "A Herschel and APEX Census of the Reddest Sources in Orion: Searching for the Youngest Protostars" by A. Stutz et al., in the Astrophysical Journal.